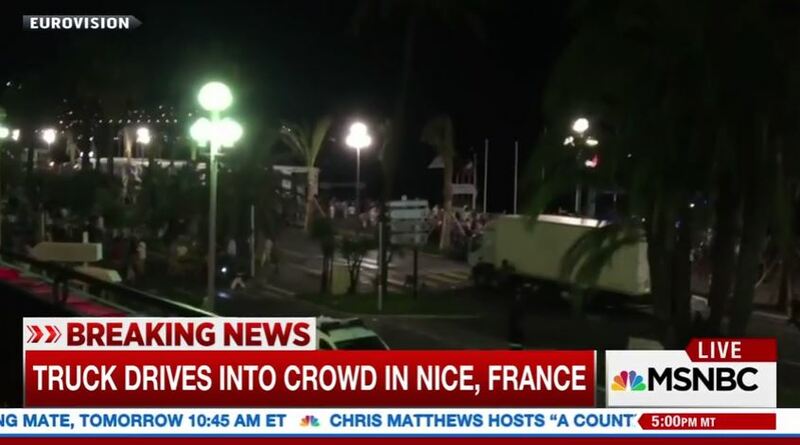 As has been reported all over the Internet, including here, some 80 people were killed in Nice, France, when a truck driven by a 31-year-old Tunisian well-known to police for armed attacks, plowed through a crowd of Bastille Day revelers. Both Donald Trump and Hillary Clinton have responded to the attack, with Trump saying he would ask for a declaration of war while Clinton advocated more intelligence gathering. On behalf of the American people, I condemn in the strongest terms what appears to be a horrific terrorist attack in Nice, France, which killed and wounded dozens of innocent civilians. Our thoughts and prayers are with the families and other loved ones of those killed, and we wish a full recovery for the many wounded. I have directed my team to be in touch with French officials, and we have offered any assistance that they may need to investigate this attack and bring those responsible to justice. We stand in solidarity and partnership with France, our oldest ally, as they respond to and recover from this attack. On this Bastille Day, we are reminded of the extraordinary resilience and democratic values that have made France an inspiration to the entire world, and we know that the character of the French Republic will endure long after this devastating and tragic loss of life. But the question now is, what will he do next? Will he take any concrete action to stem the tide of attacks around the world? Or will he revert to form and advocate even more gun control and more unvetted refugees from countries known to be hotbeds of terrorism? Will he repeat his Dallas performance and lecture us about the evils of racism and conservatism while looking down his nose at us? Will he go to the United Nations to tell the world that the future doesn’t belong to those who insult the Prophet Mohammed? Or will he use the occasion to call for truck control? After all, if the driver of the vehicle had a proper background check before being granted access to a truck, this might very well have been avoided. It may sound facetious, but the last seven years or so has shown us that anything is possible with this regime. No matter what action he chooses to take, if any, history has shown that it will in all likelihood, be weak, feckless and ineffective. Maybe one day, we’ll have a real president who will realize the very clear and present danger the world faces from those who support the ideology that drives groups like ISIS and will do what is necessary to stop it.